#Microsoft365 – Microsoft Graph is the gateway to Office 365 data. Think of a master key that opens many doors – AND you have the permissions to do so – AND it’s secure. Pretty awesome right? Well let’s take a look. For previous posts in my #Microsoft365Challenge go to the index page. Microsoft Graph is the gateway to Office 365 data. 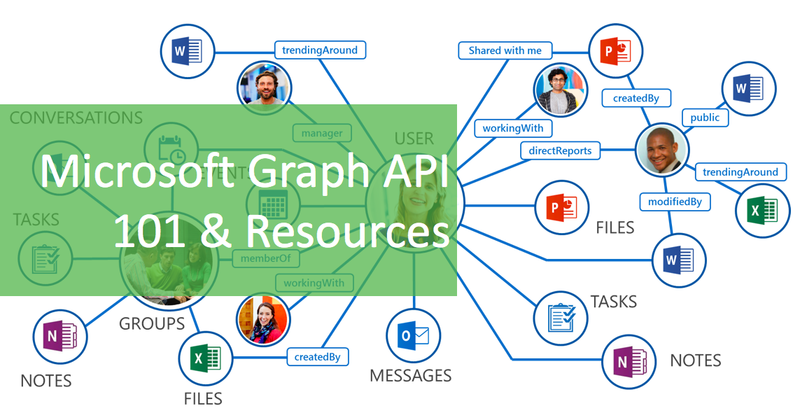 The data is accessible via single end point hosted in graph.microsoft.com that allows developers access to data that is sitting across all of the different services. This can be users, groups, files, messages, events etc. A set of functions and procedures that allow the creation of applications which access the features or data of an operating system, application, or other service. I’m sure I’ll return to Microsoft Graph later when I start learning more about Azure etc. For now at least I understand it a bit better. I hope you do too? I will write 365 blogs in 365 days around Microsoft 365. I did a similar challenge with Office 365, blogs can be found here. I won’t just be talking about the new Microsoft 365 subscription model. I will be sharing any news, tips and tricks around Office / Office 365 / Windows / Mobility and Security. And let’s not forget all the great new Apps & services available. A lot of what I’ll share on Office and SharePoint will also be applicable to none “Office 365” versions. Feel free to #AskBraam if you have questions or would like me to write about a specific topic. I’ve created a Flow to monitor Twitter for the #AskBraam hashtag and will try my best to incorporate any questions into the blogs, or answer them directly on Twitter. This is a “Learning through Sharing” approach to teach my pet sheep about Microsoft – read more on this here.